Most subscription companies think if they just increase the value they deliver to their members, that retention will improve. While adequate value is crucial, delivering more value does nothing to increase retention. Instead, you grow your community, create engagement and build the value of what you’re delivering and show the customer how what you’re delivering solves problems. Then show them how they can use it in their life and how they can get tremendous value. It’s not about the product you’re delivering, you must demonstrate how to use you’re the product you are delivering to improve or solve problems in your members’ lives. There are a lot of great insights in today’s episode with my guest Leslie Emmons Burthey, VP of Marketing for the successful subscription box, FabFitFun. A subscription box with a great retention rate, even though it’s one of the premium priced offerings within the subscription box niche, thought by many, to be dominated by discount offers. One of the things that sets FabFitFun boxes apart from their competition in the luxury subscription box business, is the multi-page, color magazine insert that tells the story of each product. Customers can see the time and thought that goes in to each product that is included in the box. The magazine also highlights customer experiences with products and often tells the stories of the buyer, delivers announcements, enhances the customers knowledge of each product and how to use it in their lives. Leslie says, at FabFitFun, “It’s not just about the physical product, it’s also about the community you build. “Customer Forums give people a place to give feedback about the products, share comments, personal stories, and interact on a deeper level. There have even been personal meet ups and spin-off communities in some of these forums. When customers have relationships with other members, their loyalty extends well beyond the products they receive each month. They don’t want to leave because they’ll lose the relationships, and your member satisfaction and enthusiasm remains high. FabFitFun looks for new ways to engage customers and add value beyond the products inside the box. Their TV channel has fitness classes and soon will be launching a food show, more benefits of membership, that don’t fit into a box. I hope you find the full interview with Leslie as fascinating as I did! I think we all can learn from her how build community with our customers, add value to your subscribers, and think beyond the box for creative ways to keep people happy and continue subscribing. 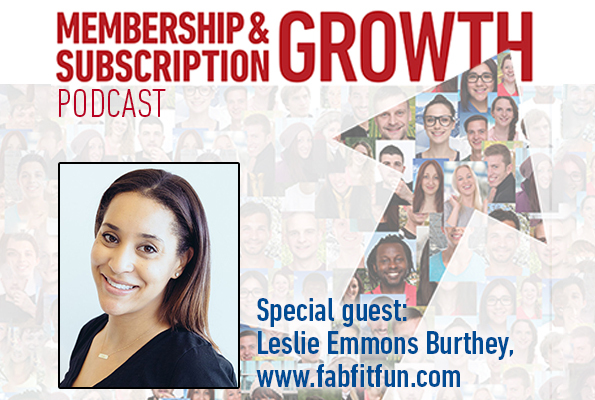 To learn more about how to deliver benefits members want and will pay for, listen to the full interview with Leslie on the Membership and Subscription Growth podcast.